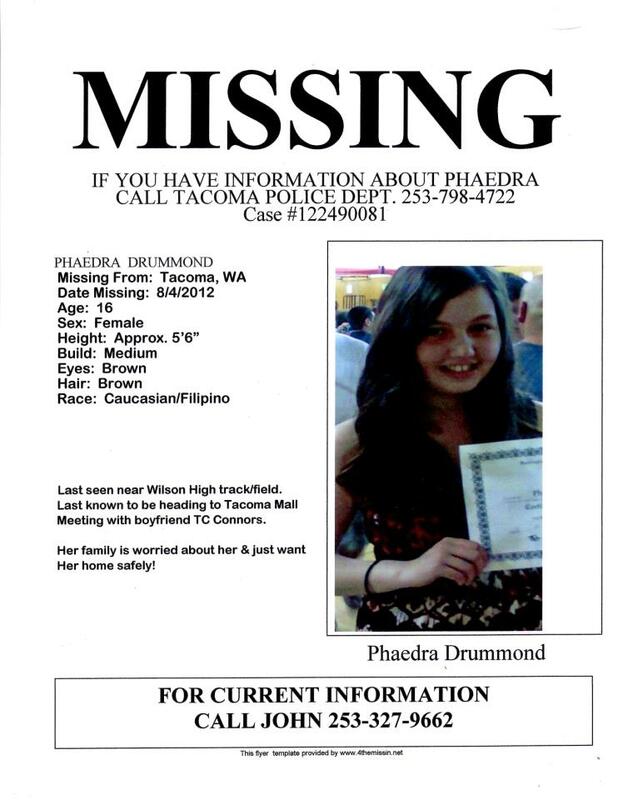 UPDATE: Phaedra has been found and returned to her father. Thanks to everyone who shared this post and helped get her home. This entry was posted in Tacoma Crime, Tacoma stuff and tagged Missing Person, Phaedra, Tacoma. Bookmark the permalink. This is so sad. Tacoma is so dangerous. I moved away three months ago and live on Bainbridge Island. Bad things happen in Tacoma all the time, but its dangerous reputation is far worse than the city actually is. We’ve had seven homicides this year. Seattle has had over thirty. Back east, cities like Baltimore have hundreds of homicides a year. Like any city, it has its good areas and bad areas, but in all honesty Tacoma is far safer than in the 1990s when it earned its bad reputation.